Hoi An is a postcard perfect historic riverside town that has been carefully preserved so that the Old Town looks as it did centuries ago; however, the town is hugely popular and the crowds might have you searching for some Hoi An day trip destinations. Hoi An is certainly a gem but we were feeling a bit claustrophobic in this UNESCO heritage town after a couple of days, so we decided to spend a day exploring the nearby area. We booked a day tour through eOasia which is an online booking website that consolidates local tours and activities in more than 12 different countries in Asia. 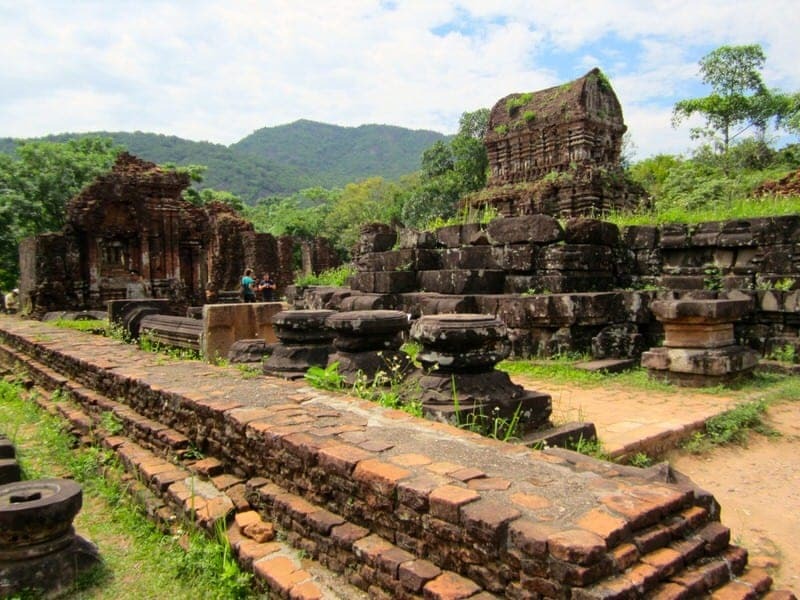 The tour we chose included the temples at My Son, a local market, a local pottery village, and a relaxing cooking cruise along the Thu Bon River; however, there are also several other worthwhile day trip destinations in the area. We’ll give you some Hoi An day trip ideas and share the places we visited on the day trip we booked through eOasia. Cham Islands – These 8 small islands of Quảng Nam, which form a part of the Cu Lao Cham Marine Park, are a great place for snorkeling, hiking, camping, and diving. Cua Dai Beach – Palm-lined sandy beaches are located only a few miles from Hoi An and the beach area is very long, snaking its way to Da Nang. While parts are now taken over by beach resorts, you’ll likely be able to stake out a nice patch of beach if you take the time to explore. Da Nang – This nearby city makes for a good day trip and you can come here to explore sites within the city such as Cao Dai Temple, the Museum of Cham Sculpture, and Da Nang Cathedral. If you spend a night in Da Nang, you are closer to a number of other great day trip options such as Bach Ma National Park, Lang Co Beach, Son Tra Peninsula (Monkey Mountain), Ba Na Hill Station, and China Beach. Da Nang also serves as the closest major transit hub to Hoi An with a train station, airport, and a bus station. Hai Van Pass – This is one of the most scenic hillside roads in Vietnam along Highway 1, stretching from Hue to Da Nang. As a day trip from Hoi An, you could drive a section of this road for some great views. If you drive it yourself, be careful as it is very steep and curvy in many sections. Motorbike tours are very popular along this route. Marble Mountains – In between Hoi An and Da Nang lie five large hills known as the Marble Mountains. Cham people once used these hills for shelter and they currently contain a number of Buddhist altars. Explore the peaks to discover caves, temples, and paths. My Son – Built between the 4th and 13th centuries, this UNESCO heritage site is the largest collection of Champa architecture in existence. Once it included over 70 temples, but currently only about 20 are well-preserved. Small Villages – There are a number of small towns and villages within a couple of hours of Hoi An that you can visit and many are known for a traditional occupation or product, such as Cam Kim Island, Duy Vinh (sleeping mats), Kim Bong (carpentry), Thanh Ha (pottery), Tra Que (vegetables), Thanh Nam (fishing), Cam Thanh (water coconut palm). A great way to get into the countryside around Hoi An is to take a bicycle or motorbike into the rural areas and then stop at a few villages along the way. You can also book van and bus tours that will include some of these villages. 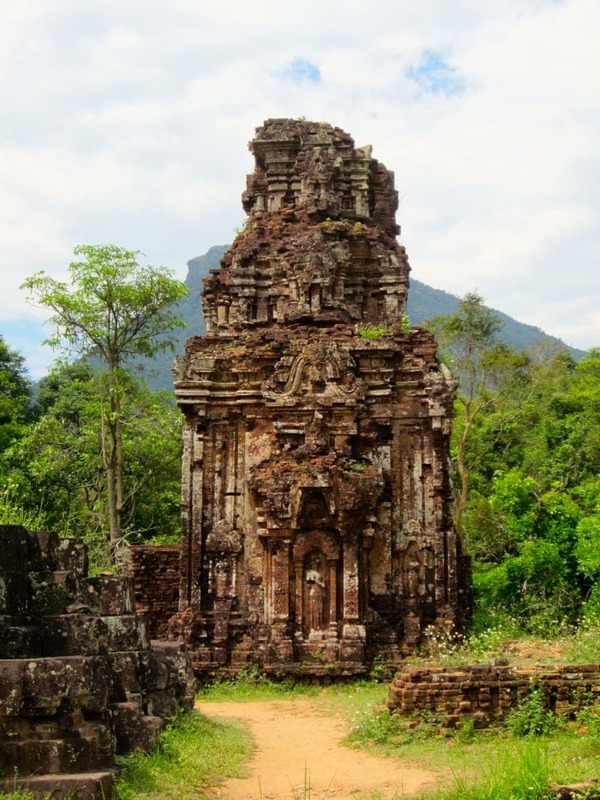 When researching our day trip options for Hoi An, we were not sure if we should just try to book with a local tour agency once we got there or book online ahead of time with a company. We found eOasia, which is an online booking platform that allows you to book local tours, activities, and transportation services all over Asia. eOasia was created by a group of friends living in Asia who love traveling and they wanted to make it easier for travelers and local tour operators to connect online. Staff members at eOasia generally meet operators and test many of the tours before they are offered on their website. In a few clicks, you can search, select, and book services and things to do in more than 12 countries across Asia, including destinations in South Korea, China, Vietnam, Cambodia, Laos, Thailand, Philippines, and Indonesia. 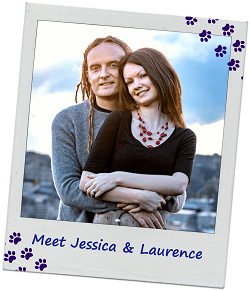 They have hundreds of activities available on their website, from tandem paragliding in Bali to cooking classes in Vietnam and from kayaking in Laos to learning about the practice of foot binding in China. We found the eOasia website super useful as some operators are quite small and don’t have a large online presence or do not have an English language website. After going through over a dozen exciting possibilities (bicycling in the countryside, buffalo cart tours, motorbike adventures, diving, cooking classes, cruises, homestays, city tours), we decided on the following day trip: “Cruise And Cooking Class From Hoi An To My Son” which includes a visit to My Son, a local market, a local pottery village, and a relaxing cooking cruise along the Thu Bon River. 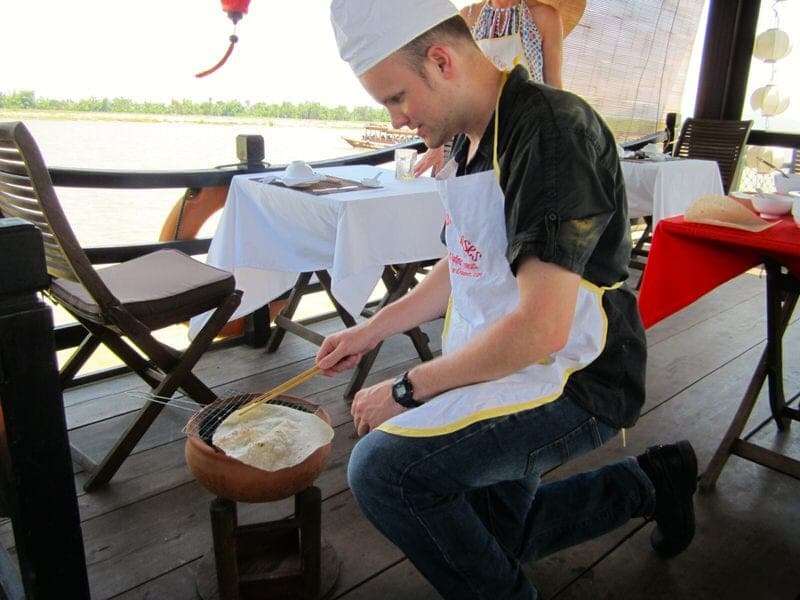 The tour lasts for 7 hours and costs $59/person which includes lunch and pickup from your hotel in Hoi An. We later discovered that the price is the same if you book through eOasia or if we had booked directly through the local operator Cinnamon Cruises, meaning eOasia is not charging you any extra fees. After making the booking, you’ll get a confirmation e-mail and voucher from eOasia that will include all the local operator information and you may also get another email directly from the operator. We had no problems booking the tour or with the local operator once we arrived. Everything seemed well-coordinated. If you are heading to Asia in the near future, we would definitely recommend checking out eOasia for possible tours, activities, and transfers for your trip. We found it to be a very convenient and easy way to book local tours. eOasia also strives to offer the tours at the same price or even discounted than if you booked directly from the operator! Even if you don’t end up booking something through them, you can get a good idea of the types of activities that are available. On the morning of our tour, our guide came and greeted us at our hotel, Ving Hung 1 Heritage Hotel, as scheduled. The guide walked us to a waiting van where we met the driver and then picked up a third person. So the group was just Ethan and I plus a woman from Slovakia. It was over an hour drive from Hoi An to our first stop at My Son and it is best to get there as close to the opening time as possible (8:00) to avoid crowds. Our guide gave us some information along the way and we also wrote in our travel journals. 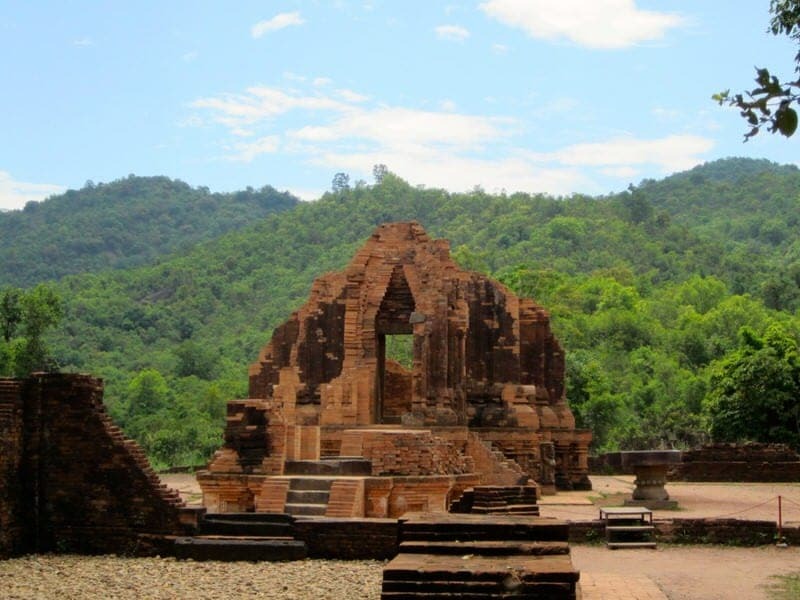 The temples at My Son are set in an atmospheric valley surrounded by the green slopes of Cat’s Tooth Mountain and it makes for a pleasant drive. On reaching My Son, you’ll park and then walk further into the site. Near the ticket office is the small Champa Museum which is worth a short visit either before or after you view the temples; however, many of the surviving artifacts are now housed in museums in France and Da Nang. Once you are close to the temples, you’ll see a performance stage area on your right which is where we watched the morning traditional dance performance. It was about 30 minutes in length and made up of several individual music and dancing acts. I am not sure how traditional this was, but some of the performers were quite striking. Next, we moved onto the actual temples. 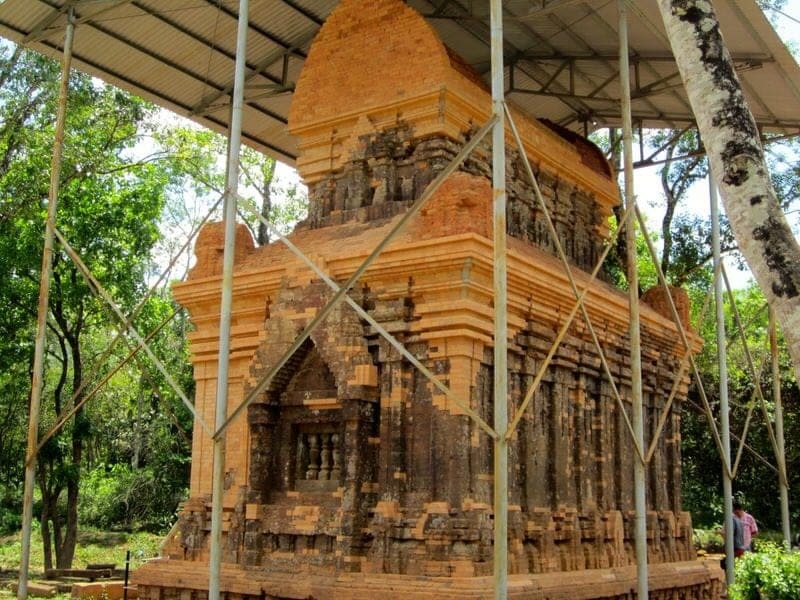 The My Son area was chosen as a religious sanctuary by King Bhadravarman I in the 4th century, and the temples were built by members of the ancient kingdom of Champa from the 4th to 14th century. Built primarily to honor Hindu deities, particularly Shiva, these important Cham temples are in various state of ruin and set in a jungle setting. The temples are split up into a number of lettered temple groups, and some of the temples are off-limits to visitors. The three main groups are A, B-C-D, and E-F. 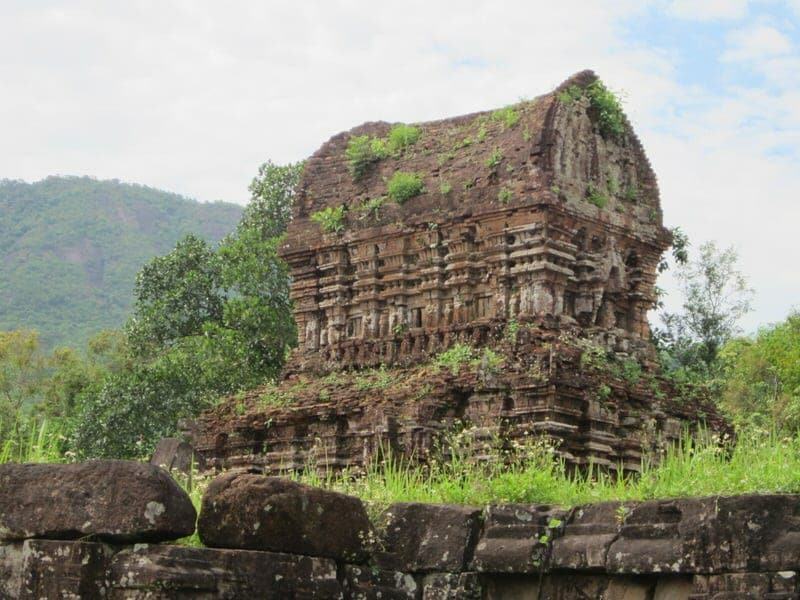 There are over 70 temples here, but many are badly ruined (some are just piles of rocks) and only about 20 are fairly well-preserved. While some were ruined or destroyed by weather and time, the most damage came from bombing by Americans in the Vietnam/American War. It was sad to see the large depressions in the ground where the bombs had landed and the crumbled remains of these ancient temples. Our tour guide led us around the site and he did a very nice job of telling us about the Champa Kingdom, Cham people, the Hindu religion, the building techniques believed to be used to construct the temples, the uses of the various buildings, etc. I would highly recommend either reading a good guidebook about My Son or hiring a guide as it really enhanced our experience of visiting these temples. Now if you’ve been to Angkor Wat and surrounding temples near Siem Reap in Cambodia, you might be very unimpressed at My Son. Indeed, this is not Angkor Wat. These temples are much smaller in scale and less well-preserved. However, I think I enjoyed my visit here just as much as I did at Angkor Wat. 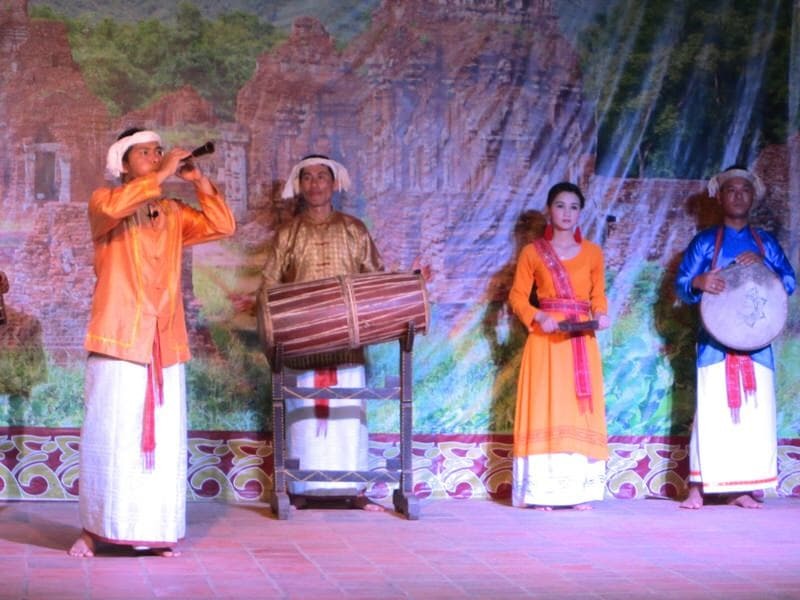 From a historical perspective, My Son was likely just as historically important and culturally significant to the Cham people as Angkor Wat was to the Khmer. Also, I found it to be more atmospheric here, less hot, and I enjoyed the opportunity to wander around some of the paths along the stream. Now, that said, if you want to increase the odds of enjoying the site I would highly recommend coming when it opens (8:00am) to best appreciate it without many other people around. Once the tour groups come, it can really spoil it, although we noticed many didn’t stay too long. Also bring water, a hat, and good walking shoes. Next we stopped at a local market in a small town but unfortunately do not know the name of it. But if you are looking for small local markets that don’t cater much to tourists, you should be able to find them if you venture outside Hoi An. There were tons of fresh fruit and vegetables, as well as meat, clothing, and other local goods. We sampled a couple of the fruits with our guide, but did not buy anything. Ethan and I had not tried durian yet and looked for this, but it was a bit early in the year for it to be at the market, and our guide explained that it is quite expensive for most locals to buy so you often have to go to the larger markets for this. If you’ve never had durian, it is quite popular in Southeast Asia and the fruit has a strong smell that most Westerners find very unpleasant, even revolting. Our next stop was Thanh Ha which is a traditional occupational village known for its pottery. This village has been known for its pottery since the Nguyen Dynasty when potters here made some items for the royal palace. 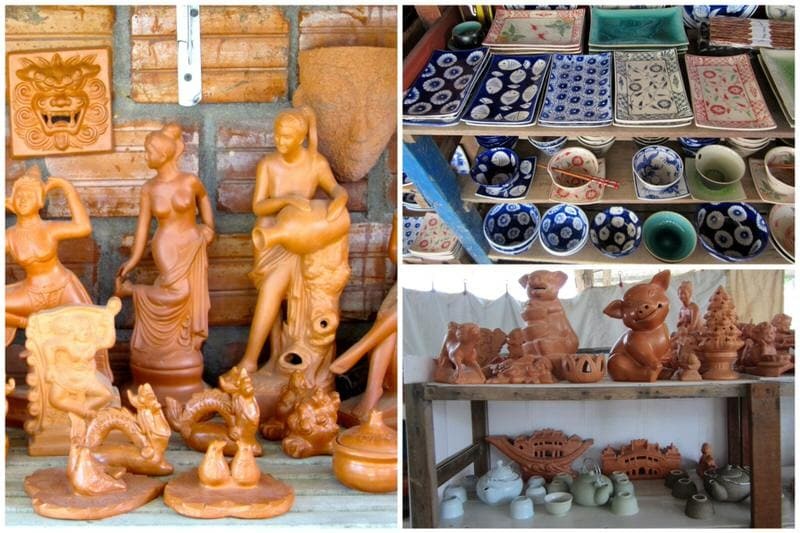 Pottery made here is quite valued both locally and internationally. and you can buy a number of items such as teapots, cups, figurines, flower pots, statues, and even housing bricks and tiles. Sadly, while there are still a number of skilled craftsman in various traditional occupation villages in Vietnam such as Thanh Ha, it is very difficult for many of these villagers to make a living doing this work full time as people can buy cheaper mass-produced goods elsewhere. Time will tell if the next generation carries on these traditions or not. During our time in the village, we visited two different shops. 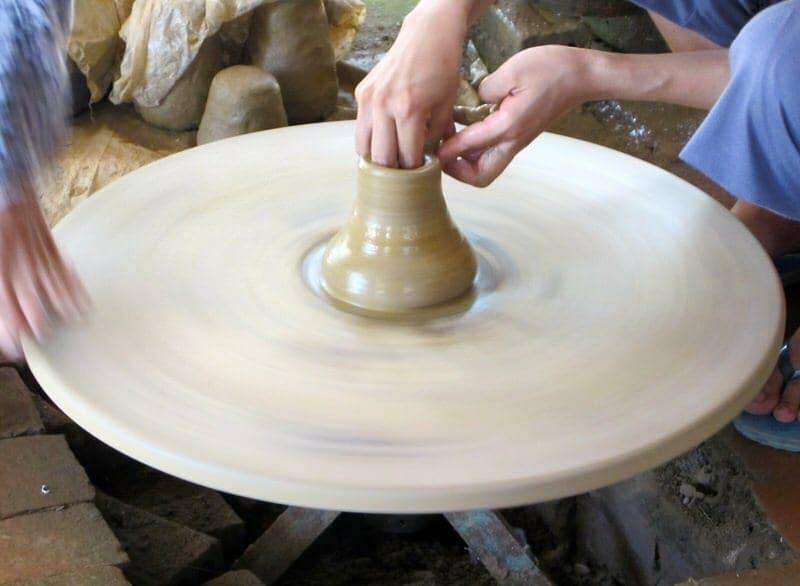 At the first, two women demonstrated how to make a small clay pot using a wooden pottery wheel. One woman used her feet to keep the wheel spinning while the second woman shaped the pot with her hands. Then I actually got the opportunity to try it as well with some guidance, and my little pot came out OK but not perfect. We then looked around the shop a bit before buying a set of chopstick rests. Then we went to a second pottery shop and received a free clay animal whistle which were included in the price of our tour. We of course selected a cat whistle out of all the various animals. 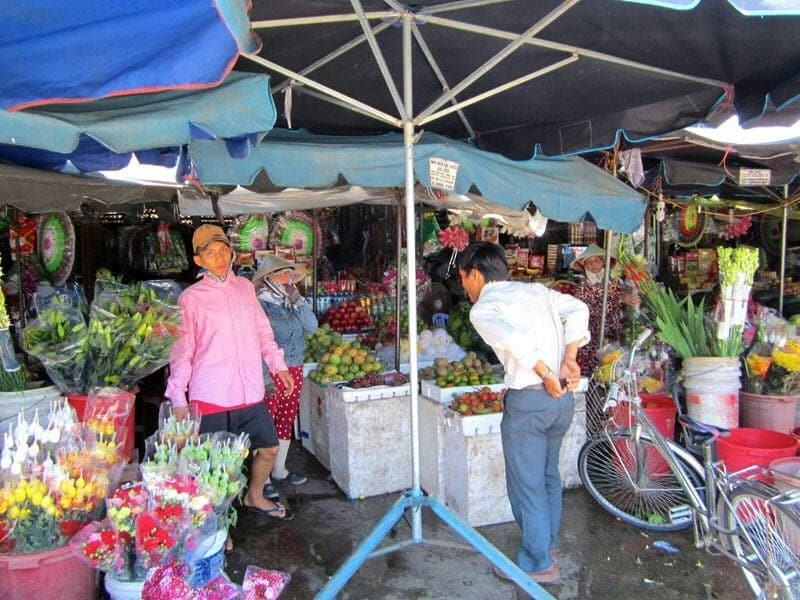 Our visit to Thanh Ha was fairly short but pleasant, the only aspect I did not like was you feel a lot of pressure to buy something while in these little shops. After the market visit, we drove until we met with where the Cinnamon Cruises boat was docked and waiting for us. We were greeted by the five or six members of the crew and given a glass of cold tropical fruit juice and chips. Then we were asked to sit down, take off our shoes, and we each received a foot massage! This felt really great after all the walking. Then we washed our hands, donned aprons and hats, and gathered around the table for the cooking demonstration. The chef was a jolly man who seemed very confident in the kitchen. Over the course of about an hour and a half we made four main dishes: banana flower and papaya salad, fresh spring rolls, bang xeo (crispy rice flour pancakes with shrimp and pork), and Vietnamese hot pot. The chef would demonstrate each step and then we would be asked to do it as well. The woman from Slovakia clearly had more superior cooking skills than Ethan and I, but we did OK. The only thing I didn’t like was that when cooking some of the meat, the oil was splashing me and I stopped and let Ethan take over. After all the cooking, we were very ready to eat! The three of us sat together and had a pleasant chat while cruising down the river and eating lunch. We were only able to eat about half of the food so we are hoping the rest was eaten by the crew after we disembarked. One thing to note is that drinks, other than the welcome drink and water, were not included in the price. We found the cooking cruise part of the tour to be really well-organized and relaxing, and was probably the most memorable part of the day. We were even given copies of the recipes for each of the dishes we made and I’d love to try to replicate them here at home. Finally, the boat dropped us back off in Hoi An and we walked back to our hotel. 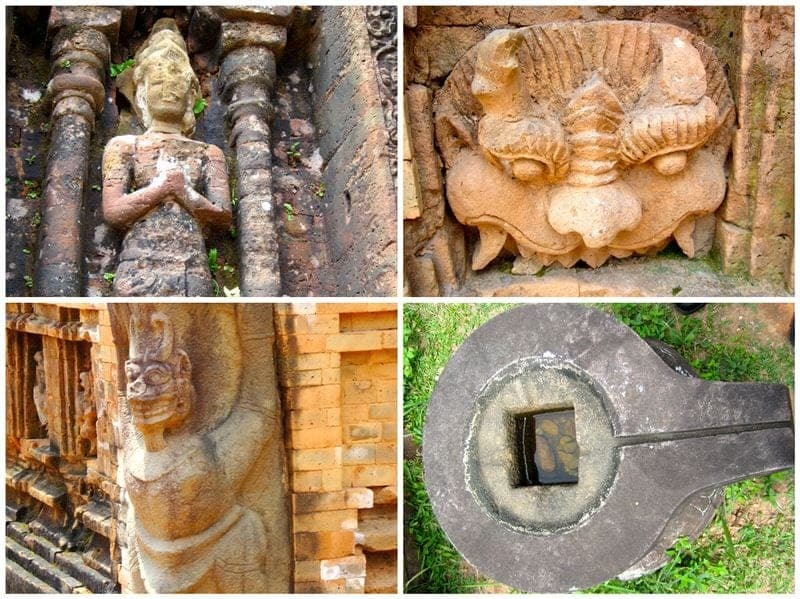 What do you think about the various attractions around Hoi An Vietnam? 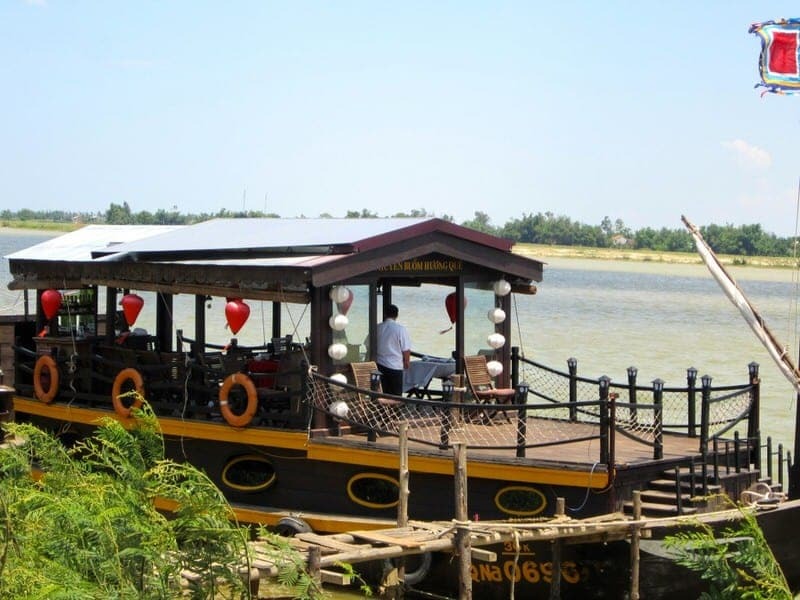 Have you done any Hoi An day trips or booked any activities through eOasia? As always, if you have any questions or comments, we’d love to hear from you! After a long time I had planned for a vacation. Your post had inspired me a lot. Amazing trip you guys had in Danang. 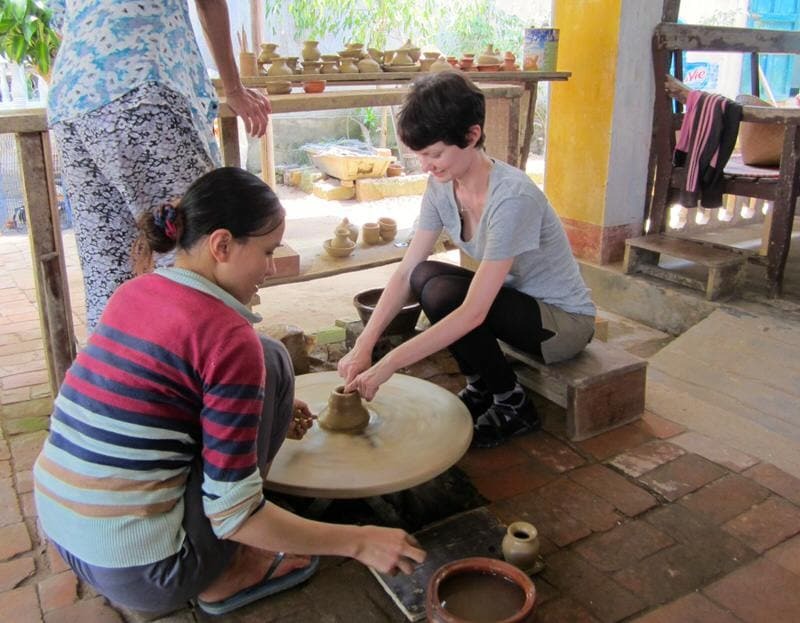 I absolutely loved Hoi An when I went last year but I wish I’d known about the pottery village, as that’s something I would have loved to have tried out. Although we did get to do a lantern making class, which was great fun! 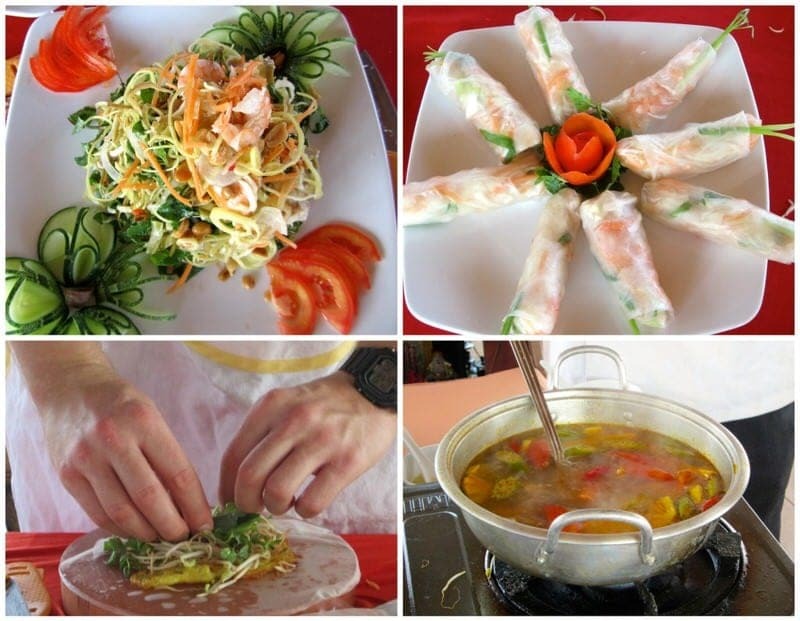 We also took a lovely cookery class in a small family-run restaurant but again, I had no idea that you could do cookery cruises – that sounds just lovely! 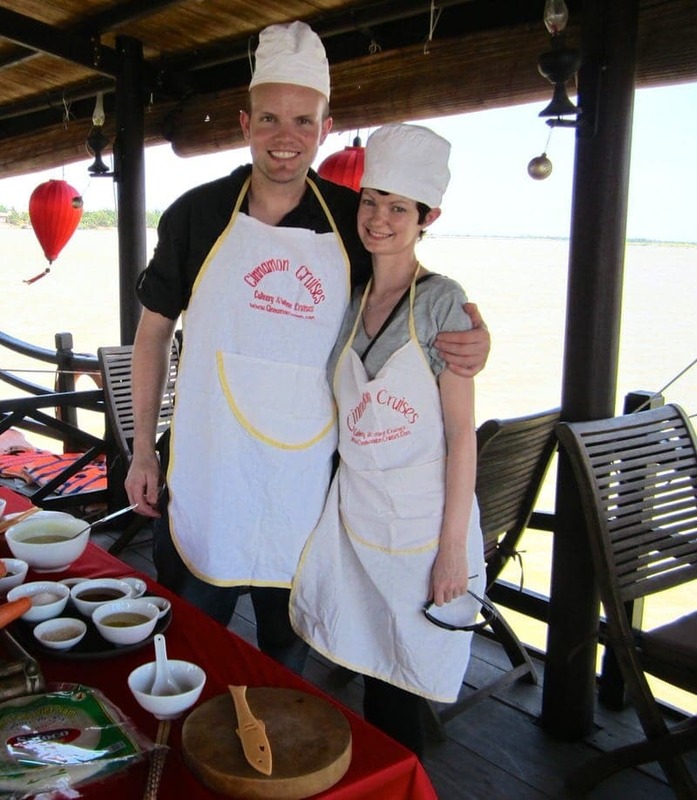 Sounds like you did plenty of fun things while in Hoi An as well! 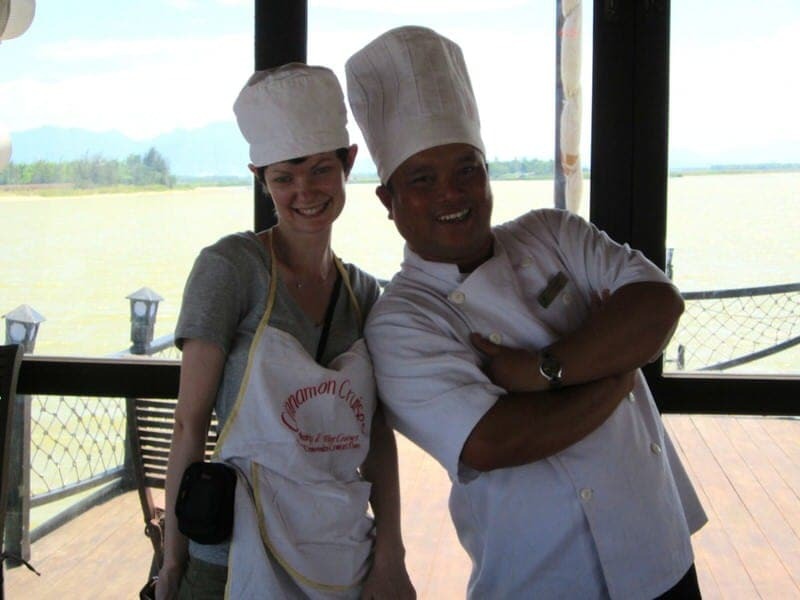 Yes, we noticed there were several cooking classes in the restaurants in Hoi An which seemed to be very popular. Although I was only in Hoi An for a few hours, it did charm me! I would love to go back and take a cooking class, lucky you! Yes, I think Hoi An is definitely worth a full day. A couple days gives you plenty of time to really wander around and take in the ambience of this great town. I hope you get back there Amy! Thanks for sharing your tips with us! I’ve never been to Vietnam but it seems to become a very popular destination! Yes, Vietnam is definitely gaining in popularity now that it is opening up more to tourism. 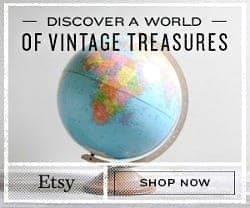 Some really beautiful spots all over the country and so affordable. Ah. 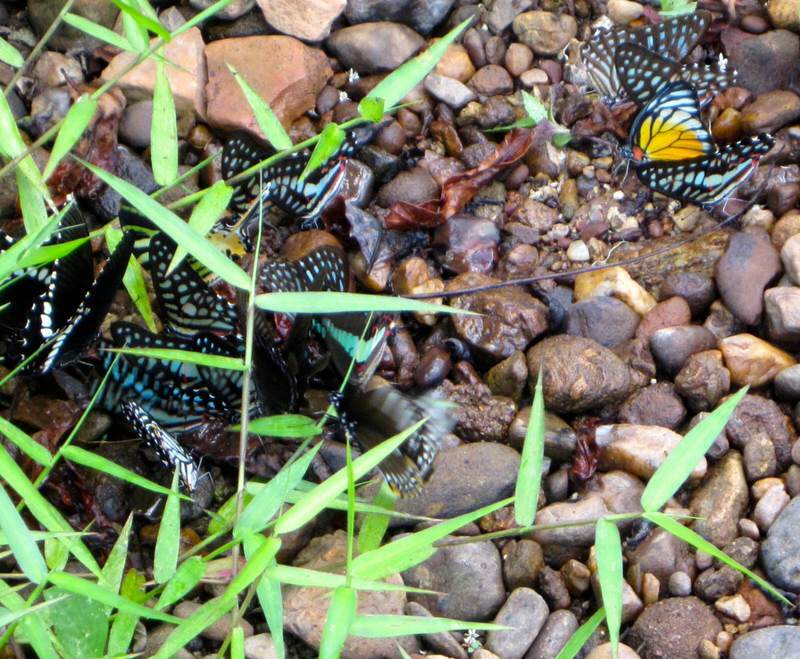 I’m dying to go to Vietnam, well – Asia in general really! It looks like you had a great day away from the crowds. I hope you get to Asia soon, this was our first trip and I can’t wait to return. Hopefully in a year or two we’ll be back. Thanks so much for stopping by Crystelle, it really was a fabulous day trip from Hoi An. Never been to Vietnam, but everyone says it is beautiful. Those temples are amazing… just something you don’t see over here. I can imagine it is powerful wandering through them. As for the Durian, I remember that both of my girls had to do a science project on this fruit, and though I’ve never had it, I remember them telling me it smelled bad:) Looks like a wonderful trip! 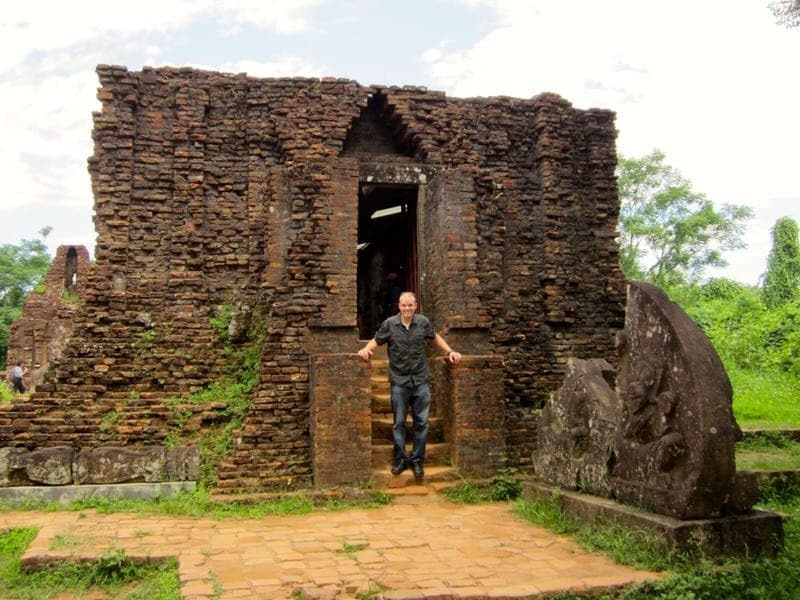 Yes, the temples at My Son were just such a great way to learn about the Champa kingdom and the Cham people in Vietnam. That is so interesting about your girls eating durian….we had it only as ice cream so the smell wasn’t an issue but the taste is quite unusual. Not something you hear about much in the U.S. Thanks Iva, the food was sooo delicious. 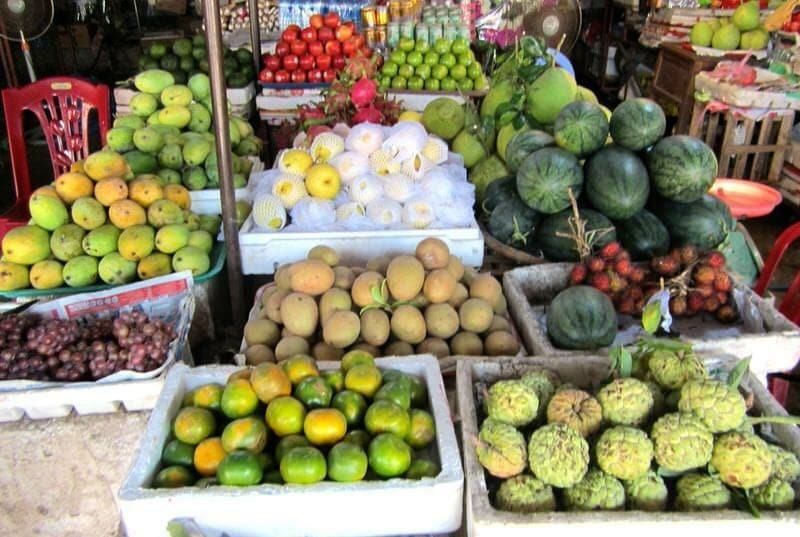 The salads in Vietnam (papaya, pomelo, mango, etc.) are so good, I wish I could have them all the time at home. We need to try that recipe! Jessica, I love your hint on eOasia. We did the My Son tour a few years ago and loved it. It’s a pretty site with some great temples and carvings. 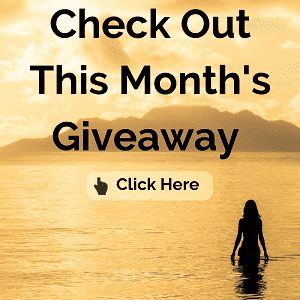 Thanks for linking up with us on Weekend Travel Inspiration. I hope to see you often. Thanks Corinne, I hope that eOasia comes in handy on one of your many future Asia travels! 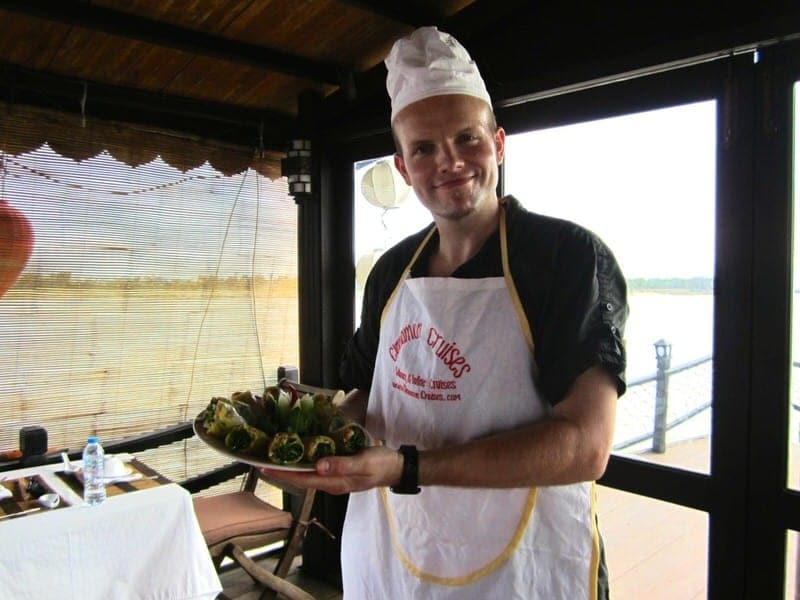 I am glad that you also enjoyed My Son as some other tourists have told us they did not enjoy it and it was a letdown after Angkor Wat and other such temples, but I personally am really glad to have visited. Thanks for hosting the linkup! Wow, thanks for the tip on eOasia! I checked out their site — definitely bookmarking it for the future. I’m really enjoying your pictures of your trip. It’s inspiring me to start planning a trip of my own! Yes, I will probably definitely use the eOasia website again to book tours. 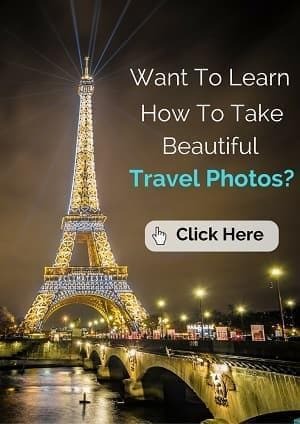 It really can save you a lot of time and they have so many local tours and activities available it was almost overwhelming to choose just one! I would love to take a pottery class, what a fun thing to do while traveling. Thanks for stopping by Kiki! The pottery piece was not so much of a class as just a demonstration but it was interesting to try it out! The cooking part was much more of a class and was really enjoyable.